Reservists in the Israel Defense Forces (IDF) stopped in Connecticut recently to reveal their never-before-heard experiences serving in Israel’s military. Yuval and Ilan (last names withheld for security purposes), whose visit to Connecticut was part of the “Israeli Soldiers Tour” organized by the international Israel education organization, StandWithUs, also talked about their family backgrounds and life in Israel, and answered some tough questions from their audiences. At an event held at UConn Hillel, Yuval and Ilan shared their stories on a panel with UConn ROTC Cadet Noah Adler, and UConn student Alexander Mollyverr, who was a lone soldier during Operation Protective Edge. They had inspiring conversations emphasizing the need for the US and Israel to support each other. The event was organized by Huskies for Israel with help from SWU’s BICEP Fellows . BICEP is a partnership between StandWithUs, Hillel (or any Jewish student campus organization) and Birthright to create programming that enhances the Birthright experience with follow-up programming on campus. The reservists also spoke at the Mandell JCC in West Hartford and at the Coast Guard Academy in New London. Born in Venezuela, Ilan made aliyah to Israel in 2010. The son of a Christian Venezuelan and the daughter of a Holocaust refugee, he grew up in a home that exemplified multiculturalism and coexistence. A resident of Ramat Gan in Tel Aviv, Ilan served in the IDF’s Humanitarian and Civil Affairs Unit, working with Palestinians on projects to improve the lives of Palestinian families. Yuval, 25, studies law at the College of Management Academic Studies in Rishon LeZion. She served in the Israeli Air Force. Following her military service, Yuval traveled through Central and South America. Last year, she volunteered to be part of a humanitarian delegation to Tanzania helping to renovate a school and teach children English and mathematics. She now lives on Kibbutz Palmachim. 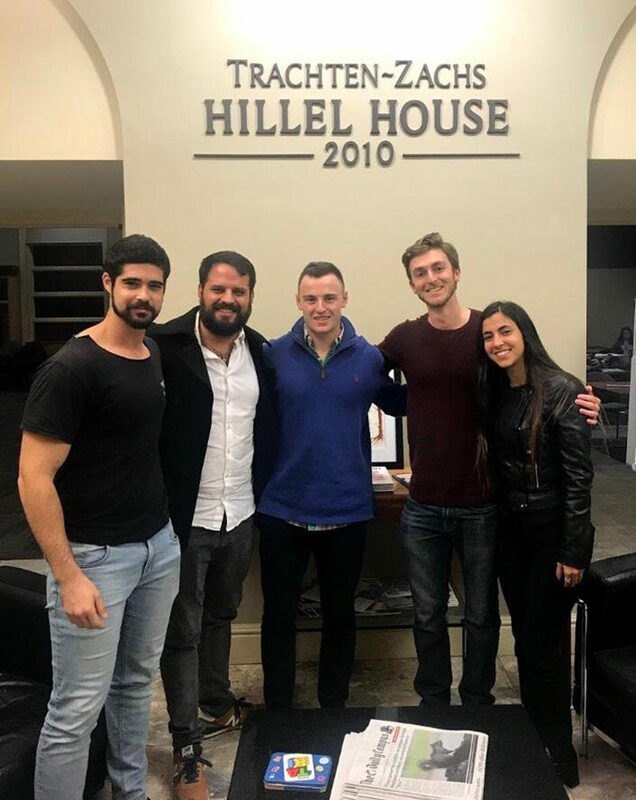 CAP: At the UConn “Israeli Soldiers Tour” event: (l to r) Tom Barkan, Uconn Israel Fellow; Ilan, IDF reservist; ROTC Cadet Noah Adler; UConn student and lone soldier Alexander Mollyverr, and IDF reservist Yuval.